salsa verde and pig-cheek vinaigrette. It takes a certain kind of bravado to replace a much-celebrated, crowd-pleasing chicken dish with the more adventurous crispy rabbit Milanese. The engine that drives this “little gastropub that could” is quiet confidence and an urge to innovate — slowly, methodically, and for all the right reasons. This kitchen is genuinely moved by the gorgeous simplicity of Italian cuisine, but it often goes beyond that. Sure, they can knock those nonna dishes out of the park, but melt-in-the-mouth meatballs aren’t designed to take us on an eating adventure — that’s where the rabbit comes in. It’s the best of both worlds. How do they pull it off? 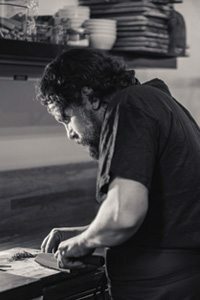 Co-owner and executive chef Marc Doiron tells me his staff functions like a co-op rather than a top-down brigade — and it shows. 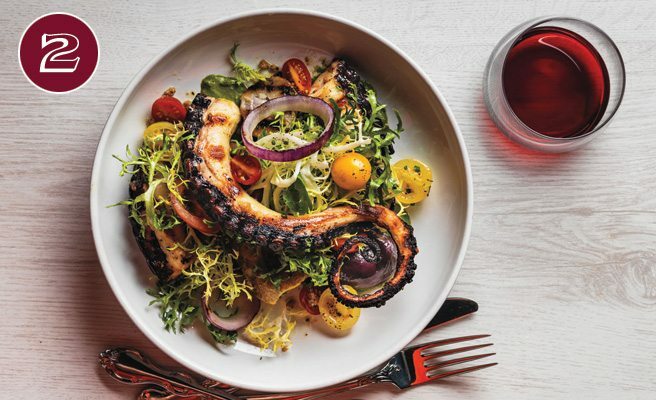 It feels as though everyone is invested in the dishes, right down to the bartender, who, as it happens, can describe exactly what’s in the marinade for the change-everything-you-thought-you-knew-about-octopus dish, as well as how long the super-tender tentacles were braised and marinated before being grilled. It explains the velvety texture, but, oh, the flavour! What on earth makes me want to lick the plate clean? Oh, that? That’s the guanciale vinaigrette. Yeah, pig fat will do that. I have always been puzzled that Doiron, a pastry chef, doesn’t do more to inflate the sweet offerings. But I now understand how much he has internalized the Italian “less is more” ethos. Keep it simple and make it stellar. This is the thought that struck me as I was moaning my way through the warm, sticky fig cake with rum sauce and coconut sorbet. Let me say first that there was almost nothing about this dessert that appealed to me on paper, but it turned out to be the best and most seductive sweet I have tasted in recent memory. Town is a very special place. And though it can no longer be considered new, it remains on my must-try list for the third year running. Plainly put, it keeps getting better. 296 Elgin St., 613-695-8696, www.townlovesyou.ca.